Going into cocoa-overload with a serving of the famous dessert "Death By Chocolate" is probably not the way to find out if chocolate is good for you. In this article, we will explore the health benefits of chocolate and provide some serving suggestions to ensure that the phrase "chocolate and health" is something other than a dietary oxymoron for you. It's rich in certain essential minerals, and it's packed with bioflavonoids, especially flavonols. Chocolate is thought to improve blood flow and elasticity in blood vessels; lower blood pressure; improve overall heart health; and reduce the risk of death from cardiovascular disease. It can decrease LDL (bad) cholesterol as well as the body's inflammatory immune responses. Chocolate is thought to improve insulin resistance and sensitivity. It can increase alertness, lessen pain and promote a general feeling of well-being. Chocolate may reduce the risk of cancer. Chocolate is a good source of magnesium, copper, and iron; with lesser amounts of calcium, zinc, Vitamin A, niacin, and phosphorus. Magnesium is critical to a large number of body functions, including the formation and maintenance of strong bones, muscle and nerve function, and regular bowel function. Iron is an important part of hemoglobin and thus is essential to oxygen transport in the body. Iron also assists short-term storage of oxygen in muscle tissue, including the muscle tissues in the heart. Copper is an important antioxidant and is critical to the body's detoxification mechanism. It's also important to the formation of red blood cells. Chocolate's beneficial levels of magnesium—56 mg in a 50g (~2oz) bar of dark chocolate—may help to explain some of chocolate's sedative effect on stressed-out people. Stress causes the body to deplete its supplies of magnesium, ultimately leading to an out-of-balance biochemistry. It may be that the magnesium in chocolate helps restore the body's magnesium balance. Chocolate also has a more direct stress-reducing effect. It contains a compound called anandamide—also known as the "bliss chemical"—that binds to certain receptors in the brain to promote relaxation. This happens in a manner similar to the effect of some components of marijuana—though the effect is much more subtle (and much more legal!). Further, chocolate contains enzyme inhibitors that decrease the body's ability to metabolize anandamide, thus "prolonging the high." Chocolate—and other enjoyable foods—are known to trigger feel-good endorphins in our brains. That effect appears to be at least partly related to our enjoyment of the food (rather than just a reaction to the components of the food), so it makes sense that when eating chocolate, we should sit back and savor the experience. That is to say, don't mindlessly spoon through that pint of Double-Fudge Chocolate Grand Slam. Sit back and enjoy it like a proper chocoholic! Another mood-altering compound found in chocolate is phenylethylamine, a chemical supposedly released by the brain when we are in love. (Love me, love my chocolate?) Many researchers, however, discount this as a mood-altering factor, noting that phenylethylamine levels are higher in cheese and sausage—which are not associated with stress reduction—and that the phenylethylamine in chocolate is too rapidly metabolized by the body to have the purported effect. The high fat content of chocolate candy does trigger the brain's production of natural opiates. Similarly, the sensory pleasures—taste, smell, mouth feel—associated with chocolate can undoubtedly have a calming effect on the eater. Antioxidants are important soldiers in the war our body constantly wages against free radicals, which can cause all sorts of cellular damage. More generally, antioxidants are essential to how the body detoxifies itself. Milk chocolate actually makes this list as well, scoring slightly higher than prunes, but we have chosen to let dark chocolate represent the cocoa contingent alone. Milk chocolate has some characteristics that make it inferior to dark chocolate from a health perspective. More on that later. protect capillaries against oxidative damage. the flavonols in cocoa reduce the chance of blood clots and prevent fatty substances in the bloodstream from clogging arteries. Unfortunately, chocolate does contain saturated fat, and saturated fat is normally a bad thing when it comes to cardiovascular health. Some research indicates, though, that the fat in chocolate is not a problem because it contains stearic acid, which is "cholesterol-neutral." That is to say, the body still processes the fat as fat, just not as bad fat. It might increase your waistline—and being overweight is definitely not a heart-healthy thing—but chocolate fat won't contribute to your level of bad cholesterol. Before we start celebrating chocolate's "neutral fat" characteristics, we must mention that one large study came to the unfortunate conclusion that too much chocolate fat is indeed a problem for heart health. In the Nurses' Health Study, which looked at more than 80,000 women over 14 years, the saturated fat in chocolate was shown to increase the risk of coronary heart disease by as much or even more than other saturated fats. So, if you are predisposed to cardiovascular problems, it is probably wise not to overdo the chocolate bars. Fear not, though, we have a suggestion later in the article about how you can get the benefits of flavonol-rich cocoa with the overload of chocolate fat. For the average person, there are two potential downsides to chocolate: fat and sugar. We already discussed the fat issue in the previous section, so let's move on to sugar. Every year, US manufacturers of chocolate products use 2.4 billion pounds of sugar and 1.4 billion pounds of corn-syrup sweeteners. Delectable though it is, sugar brings a long list of woes to the body. For those interested in a more extensive list, we recommend checking out this video at Mercola.com. feed the growth of cancer cells. Because sugar weakens the immune system, Mercola.com advises that people only eat chocolate if they're healthy, and even then only dark chocolate and in moderation. Many of the studies that showed a positive benefit of eating chocolate gave study participants only a small amount of chocolate—no more than a few ounces a day. You don't need to eat gobs of the stuff to get a positive benefit, and given the sugar issue (and less-clear saturated-fat problem), you should resist the thought that "if a little chocolate is good, more chocolate is better." A USDA study found that among all chocolate products, standard cocoa powders has the greatest concentrations of antioxidants and flavonols. Baking chocolate was a close second. Item 2 actually makes sense. Cocoa powder is what's known in the business as the "chocolate solids," with the chocolate fat—cocoa butter—separated out. Thus, cocoa powder is the purest concentration of the part of chocolate that has all the good stuff, health-wise. Unsweetened baking chocolate has the next highest concentration of chocolate solids, though we admit that we envision that few people would be willing to gnaw on a chunk of unsweetened baker's chocolate. Cocoa powder, however, is a more flexible way to get your cocoa solids, as we will discuss in the next section. One final caution about eating chocolate: Even if you are ingesting chocolate solids in a form untainted by cocoa butter or sugar, the long-term effects of high cocoa consumption or higher-than-normal intake of flavonols remain to be studied. So, don't overdo it—stick with the recommendations we offer in the "How Much?" section below (or consult with a professional nutritionist). Compared to cocoa powder, milk chocolate—the most popular chocolate among US consumers—contains about a tenth of the beneficial flavonols. Milk chocolate's performance also suffers from the fact that it contains milk, which binds with the antioxidants and reduces their positive impact. Dark chocolate—which has a higher concentration of cocoa solids than milk chocolate—gets better antioxidant scores than milk chocolate but still not as good as baking chocolate and cocoa powder. Chocolate products that use cocoa powder prepared using the "Dutch process," which uses alkali, should be avoided—the alkali destroys most of the beneficial flavonols. You can also forget about white chocolate completely—it has no chocolate solids. The higher the cocoa content the better. The less fat the better. The less sugar the better. Non-alkali processing is a must. What product best fits this bill? As we've implied up to this point, it's straight cocoa powder. Not very exciting. 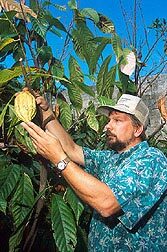 But before you dismiss the idea of drinking an unsweetened cocoa beverage, let us briefly tell you of the Kuna Indians of Panama. These native peoples have very low levels of age-related hypertension, despite salt intake levels similar to less-heart-healthy Westerners. The Kuna's secret is thought to be that they drink unprocessed cocoa. Compounds in the cocoa help regulate the nitric oxide in their blood, which is good for blood vessel relaxation. Some of the health benefits of chocolate have been observed in studies using off-the-shelf chocolate products, while other studies have used specially derived "lab chocolate"—picked and processed to ensure high levels of viable flavonol compounds. -- the procedures used to transform the cocoa beans into chocolate products. The flavonols can be destroyed at many points on the path from the cocoa plantation to the manufacturing plant to the supermarket shelf and your mouth. Wouldn't it be nice if we could just look at the label on the chocolate product and see a number for "viable flavonol content" per serving? Well, good news everyone! Manufacturers have recognized chocolate's health benefits as an important sales angle and are working to develop products with maximized and standardized amounts of antioxidants. The labels on some candy bars now give the percentage of cocoa solids. This is a good start, but the ultimate goal should be for the label to list not only the percentage of cocoa solids but, more importantly, the level of viable flavonols. And the word "organic"! OK, back to how might you drink hot cocoa made with unsweetened, organic, non-alkali cocoa powder—without gagging. If you drink black coffee or unsweetened hot tea, a mug of hot, unsweetened cocoa might not be too much of a challenge for you, and you might even find you enjoy it. (The GP founder has been doing so for years.) But if you're used to making everything you drink taste like a milkshake, well, tsk-tsk-tsk. Regardless, for those of you who would like to try enjoying a cup of hot, unsweetened cocoa every morning, here are some tips. Buy only high-quality, organic, non-alkali, unsweetened cocoa powder, preferably raw. The best stuff has beans only, no pods. Remember, you're not looking for powdered hot chocolate mixes -- they contain added sugar (and usually a few other things too). To prepare the cocoa, heat the water on your stove. Wait until the water just begins to boil in the pan, then spoon in the cocoa—one rounded teaspoon per 8 oz. water. Stir until the cocoa powder completely dissolves, let it all boil gently for 20 seconds, then remove from heat. Let it sit for a minute, stir a couple of times, then pour the chocolaty goodness into your mug and enjoy! The amount of cocoa used does make a difference in the taste—too little and the beverage tastes washed out; too much and it's overpowering. So, adjust the amount of cocoa powder you use to suit your taste buds. For an interesting twist, try adding a little bit of fresh grated ginger as part of the brewing process. Here's an option for the hot-cocoa-in-a-cup method: once you've made your hot cocoa, add hot black coffee to it to make a yummy coffee-cocoa combination. We find that about half chocolate/half coffee works well, but again, adjust to taste. And remember that you've just cut down on the amount of cocoa you're getting per cup. The good news is that coffee has its own arsenal of helpful antioxidants. If you just can't make the cocoa powder approach work for you, then we have to admit that an a few ounces organic dark chocolate every day isn't likely to do most people harm. Look for products that have the highest content of chocolate solids, with low sugar and fat content. If using pure cocoa powder: two rounded teaspoons per day. If eating dark chocolate bars: two ounces per day. Are these relationships myths or facts? We'll address these topics and more in Part 3 of this series, to be published in a future issue of Grinning Planet. Know someone who might find this article about Chocolate and Health interesting? Please forward it to them. This is Part 2 of a four-part series. Articles 3 and 4 will be published in future issues of Grinning Planet. Why not sign up for the free GP email service so you don't miss it.